In the last decade or so, native plants have gained a new appreciation in the landscape. If chosen carefully they can be hardy, easy care additions to your landscape that will tolerate well the extremes of climate that are so common in Atlanta. Droughts and late frosts can be devastating to your garden, but plants that are native to the area will generally pull through rather well. There is also some evidence to support the idea that plants that are native to a specific region are better for the native birds and animals. Some butterflies will only lay eggs on specific plants, and birds have been shown to get more calorific value from a native plant than from a non-native similar plant. A native plant is generally counted as one that grows naturally in a specific area. Plants that were introduced from Europe, Asia and South America are not native and are sometimes referred to as Exotics. Approximately 80 % of modern garden shrubs and plants were probably introduced to the continent in the 19th and 20th century. Add to this hybridization and breeding programs and you will see why some people think that making plant choices from just natives is not practical. There are however, numerous native plants that do make great additions to your garden. It is useful though to keep in mind that native plants are not always great garden plants. Some may be native but they can also be invasive weeds. As with any landscape design, you should think of incorporating shrubs, trees and perennials into your garden. There are excellent native species to do a full design, but if you choose to add an exotic or two, that is fine as well. Looking at trees specifically, there are many native varieties, such as Sourwoods and Buckeyes. Many of these of course will take time to grow into the magnificent examples that we see in nature, but given the right situation they will add stability and shade to your landscape. Slightly smaller than native hardwoods is the Large Leaf Magnolia. This splendid, tropical looking tree is native to the southeast and grows well in the Atlanta area. Other small trees include Redbuds, Carolina Silverbells and Southern Crabapples. Shrubs are sometimes called the furniture of a landscape design. Appropriately placed shrubs can guide traffic patterns or create hedges as well as stand alone as a focal point. 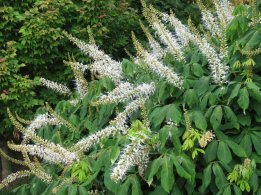 Many native shrubs grow in the understory of the Appalachians and do well in a landscape that has part shade. Shrubs such as native azaleas, Mountain Laurels and Oak Leaf Hydrangeas all do well in part shade. Gardens, of course, need flowers as well as shrubs, and native flowers are abundant. From the pure white of native phlox species to the bright scarlet of crocosmia, there is a color that will suit your landscape needs. There are native ferns that do well in both sun and shade, as well as cheerful yellow coreopsis to give height to your perennial bed. A pretty woodland garden can be filled with aquilegia, tiarella and trilliums, all native to the Atlanta region. Finding native plants for your garden can be done by searching the internet, contacting the Georgia Native Plant Society, or consulting with your landscape designer.